Sick of carrying around a bulky wallet that barely fits in your pocket? Dying to purge all the once stamped coffee cards from your life? Grabbing a slim wallet could be the perfect solution for you. Slim wallets help you prioritize what you need to carry around every day. They have more than enough room for your credit cards and cash but keep you from picking up all the extra stuff. Material: The material matters to a lot of people, some prefer leather, some prefer something synthetic that can be a little more water resistant, and some prefer something different entirely. Take a second to consider the material of your current wallet and choose something that works for you. 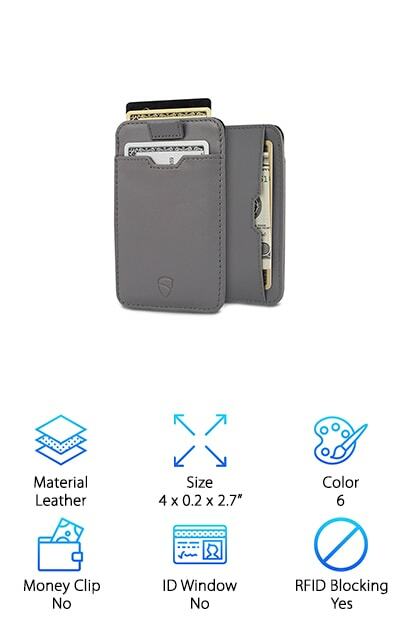 Size: To be a truly slim wallet, it has to be pretty small. If you like to carry your wallet in your front pocket, you’ll need something smaller. If you keep it in your back pocket or a purse, this may not be so important. Color: Since a wallet is something you’ll use every day, you’ll want to get something that matches your style. Many wallets come in browns and blacks, but keep an eye out if you’re on the hunt for a specific color or shade. Money Clip: A money clip is a great solution for keeping things slim and accessible. Money clips can make it easier to access your cash without bulking up your wallet. ID Window: An ID window can be especially useful if you have to use an ID frequently. This can be great for people who have to show ID to get into their building at work or for any other reason. RFID Blocking: Pickpocketing has advanced leaps and bounds since the invention of the internet. Now pickpockets can get your information without even taking your wallet, RFID blocking can help prevent this. So now that you know what to look for, let’s get straight to our list of the best slim wallets out there. If you’re in a hurry, check out our top and budget picks first. They’re what we consider the best of the best. We’ve also included eight other awesome wallet picks, so you can be sure you’re getting the best one for you. So let’s get straight to the money! Our top pick is one of the best slim wallets for men on our list. It is full grain leather, so it looks expensive without breaking the bank. It is as thin as your smartphone, so it fits easily in any pocket without creating bulky places in your clothing. It has a smart pull tab that allows you easy access to everything. This feature is a real lifesaver when searching for your card or ID. The wallet comes in colors to match every style- Texas Brown, California Desert, Charcoal Black, Chocolate, Mahogany, and Jet Black. It even includes RFID blocking technology to help keep your identity safe in many different situations. Semens even includes a year-long warranty to cover any factory defects as a result of their manufacturing process. This guarantee can help you feel confident when buying a wallet from them, and they’ll even refund you if for some reason you are not 100% satisfied. This wallet is a great choice for anyone looking for something stylish and durable on a budget. It uses top RFID blocking technology to make sure all of your personal information is safe from identity theft. 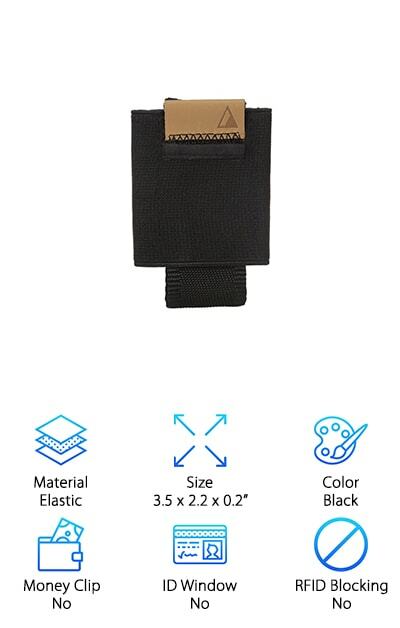 It is a perfect solution for people looking for something slim and compact that can hold all of their cards and cash safely for years to come. The quick access ID window allows you to easily grab your ID at any time. It also comes with 10 card slots and two long top slots for money. It also comes with a year-long warranty to protect you from any manufacturers defects that affect the wallet before it reaches your pocket. This minimalist and durable wallet is sure to be a faithful companion for years to come. With twenty colors to choose from, there’s something for every style. 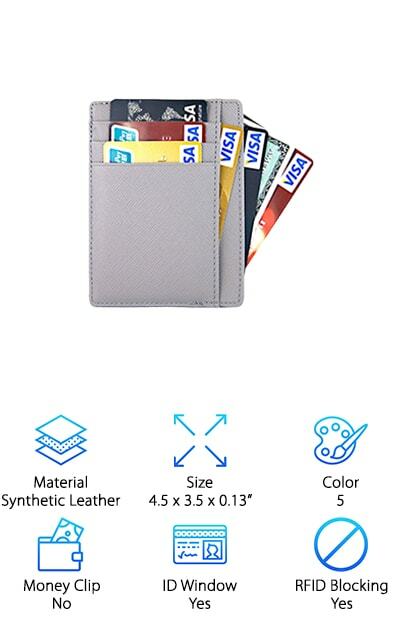 This is a great choice for anyone looking for a great budget slim credit card wallet. 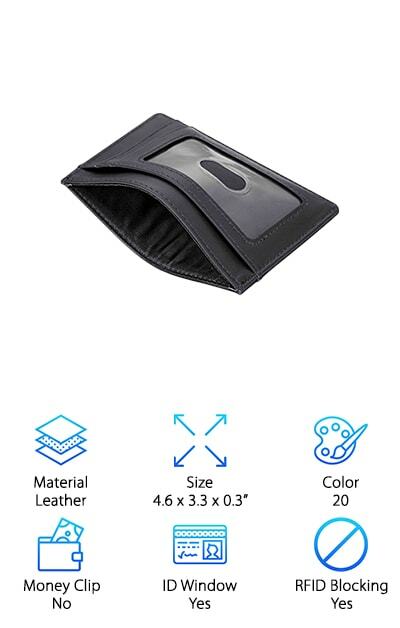 This awesome wallet is a perfect choice for people who need something that makes all your favorite cards easy to access. The patent-pending FlexLock pockets on this Distil Union Slim Bifold Wallet makes sure everything is easy to reach while keeps your cards from falling out of fatigued leather. This ensures your cards are always safe and where you need them when you need them. The internal money clip eliminates any excess bulk by keeping your money discreetly in the center or the wallet. This wallet is skillfully crafted out of beautiful leather, with hand rolled edges. It is made only of leather certified by the LEather Workers Group, so you know it’s high quality. If you’re a fan of using NFC to pay your bills, this wallet is the perfect choice for you. It is completely NFC compatible, so you’ll never have to worry about your wallet getting in the way of your cards. It also includes a year-long warranty, so you can purchase with confidence. 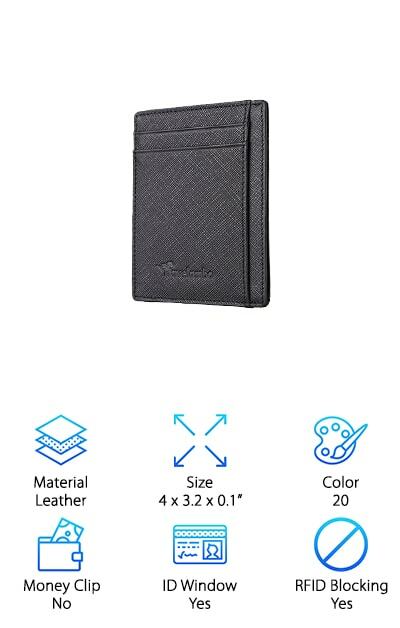 This is a great pick for anyone looking for a slim front pocket wallet. This minimalist wallet fits right into your front pocket without being uncomfortable or sticking out in any way. It comes in 24 vibrant colors to match every style. Everything from a classic black or brown to pink, blue, and green. This makes it a perfect choice for anyone looking for a specific color to match their style. It is made of genuine leather, which makes it feel great in your hands and keeps it looking amazing. It has six card slots, an ID window, and a money pocket, so there’s a place for everything. It even has RFID blocking that can keep you protected from virtual pickpockets. The slim design makes it easy to take anywhere, so you’ll never have to worry about your bulky wallet. 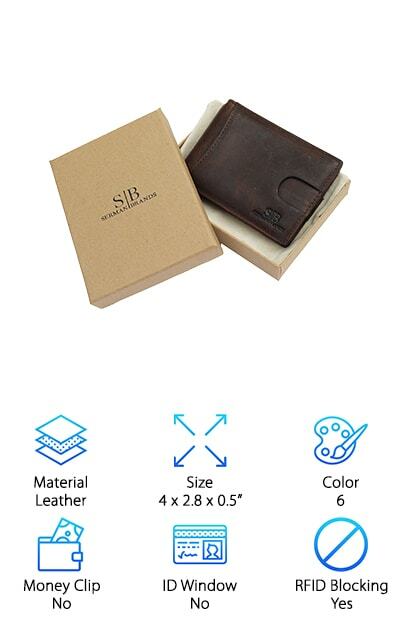 This is a perfect wallet for most people searching for an incredibly slim wallet with an ID window for easy viewing. This truly ultra-slim wallet is a great choice for anyone looking for a simple and slim solution. It comes in five colors, with the option to upgrade to more slots if you need them. The colors are all great for people who love the basics. They are a range of greys, blacks, and browns. It comes with three credit card slots, one ID window, 1 pocket, and a currency pouch. This helps keep it slim and functional, without overloading it with pockets and slots. It includes RFID blocking to prevent electronic pickpockets from getting their hands on your information. This wallet is a great choice for anyone looking for a simple and basic wallet that will get the job done well. 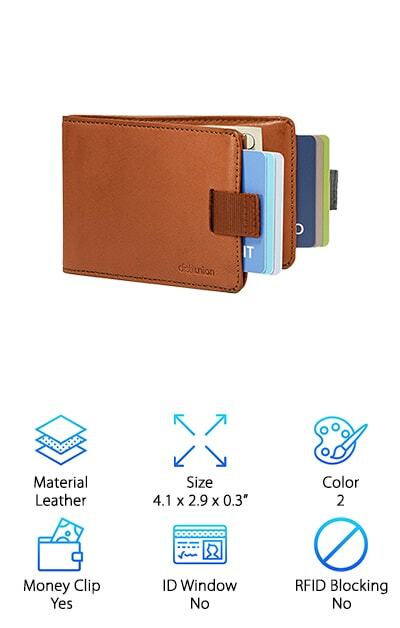 This wallet is perfect for people who want RFID protection for their cards but still want to have a slim and easy to use wallet. The three credit card slots are all RFID protected and can help keep your account information safe from thieves. One of our top choices for the best slim men’s wallet around, the Vaultskin Chelsea Slim Card Wallet is a great choice for anyone looking for a great and simple wallet. 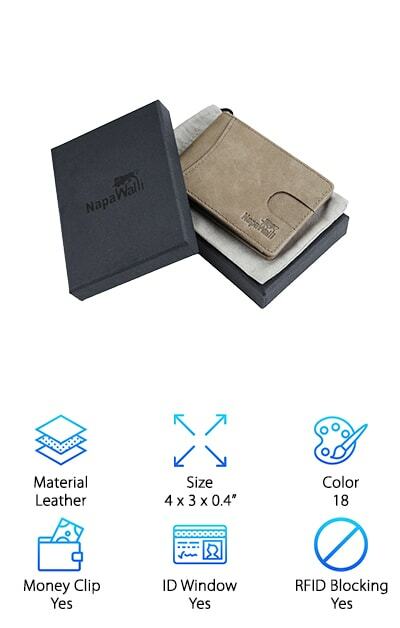 This wallet is a great choice for anyone looking to give a wallet as a gift, as it is a wonderful quality piece as well as a great simple solution to bulky wallets. Its minimalist design is made of luxurious top grain leather, sure to feel more expensive than it is. It even includes RFID blocking to keep information stored in the wallet safe and secure. RFID blocking prevents any virtual pickpockets from getting your information. This allows you to feel safe when you travel, whether it's just on the morning subway to work or in a foreign airport. The smart strap included allows you to easily access your cards, making using your wallet a breeze. It includes three pockets that can hold up to 10 cards, plus your cash. The NOMATIC Black Slim Wallet is certainly the most unique solution we’ve come across in our wallet review. The sliding design allows you to easily store all your cards and access them all easily with one hand. It holds everything securely while allowing you snap access to all of your most used cards. Just pull the tab to access your cards easily and quickly. The secure pocket allows you to store things like cash, coins, and keys without worrying about them slipping away or bulking up your wallet. This clever wallet is a great solution for people looking for something that has been specifically designed for people on the go. It has the ability to store up to fifteen cards, plus cash and keys. The minimalist design is sure to go with anyone's style. NOMATIC also includes a no hassle money back guarantee, which allows you to buy with confidence. You won’t have to worry about receiving a product that is below their standards. 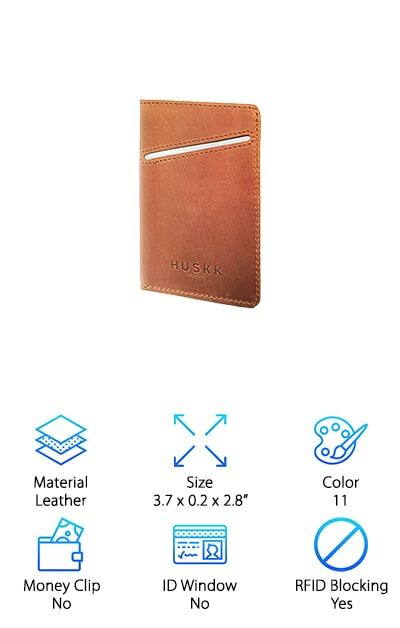 If you’re on the hunt for the best-looking thing in the world of low-profile wallets, the Huskk Slim Wallet is for you. Its beautiful leather construction is sure to wow every time you pull out your wallet. It comes in eleven rich and beautiful leather shades. This wallet is designed to hold up to 10 cards, so you’ll never have to worry about running out of room for all your cards. It even has RFID blocking to keep all your personal information safe and sound inside your wallet. This is a perfect solution for those searching for a simple and slim card holder solution that looks fabulous. This is a great fit for people who value design and could make a perfect gift for anyone that is hard to buy for. Every item by Huskk comes with a six-month warranty and support, so you can be sure that you’re buying a quality product. This wallet is perfect for anyone on the hunt for genuine leather. This wallet is a great solution for anyone who just needs to carry the basics with them. It comes with one ID window for easy access at the bar or anywhere else you need your ID. It also has four credit card slots, so you won’t have to leave any of your important cards at home. It has two additional slip ni pockets for things like receipts, tickets, or anything else extra you may need to store in your wallet. It also has a money pocket in the middle that is perfect for storing your cash. This allows you to access everything you could possibly need from your wallet in just a few simple steps. The leather is soft and comfortable, making it a perfect choice for anyone looking for something top of the line but not top of budget. If you need to be able to keep your money flat, not folded, you need the best slim bifold wallet. This one by NapaWall is a great choice for anyone looking for something easy to use and stylish. It comes in 18 stylish colors that can match anyone’s taste. The colors are- black, deep brown, khaki, coffee, reddish brown, deep blue, purple, blue, green, red, carbon fiber black, carbon fiber blue, carbon fiber coffee, deep black, vintage deep blue, vintage brown, vintage blue, and vintage gray. With such a wide range, you’re sure to find something that you love. It also provides RFID blocking to keep your information safe from any potential pickpockets. 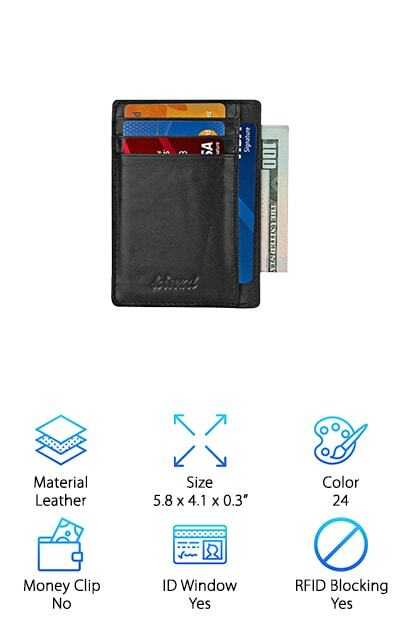 It has a front pocket for your most used card, two inside pockets for the rest of your cards, a money clip to securely hold your cash, and an ID window for easy access. This is a great choice for anyone looking for a great slim bifold wallet.